Having manufactured every type of waders for over 30 years, we have seen just about every fault, issue or problem, there is to see. And some might be surprised to hear, that in more cases than not, it is not the waders at fault, but more often the wearer or the tackle shop salesman. 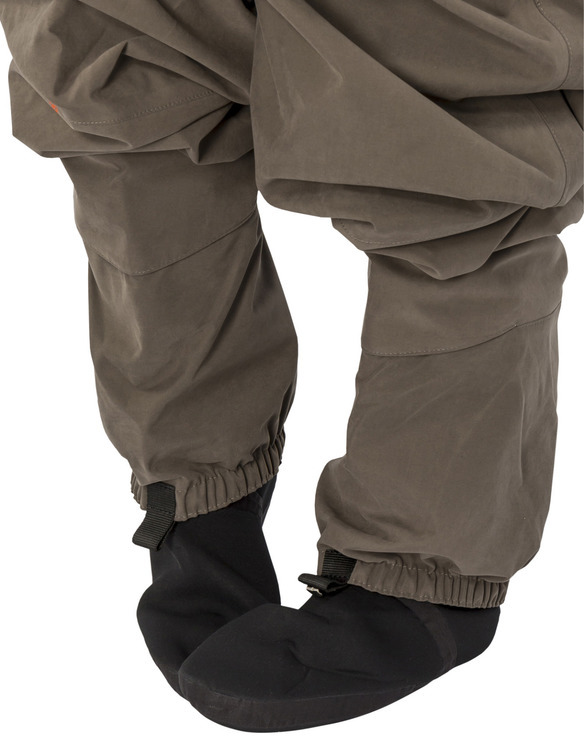 Apart from the obvious puncture damage, the most common leakage points we see time and again for all waders are the ankle, where the boot or sock joins the upper material, at the knees, at the crotch, or the seams. Very often these problems are not due to manufacturing faults, but are more likely due to the wrong size of waders being chosen. 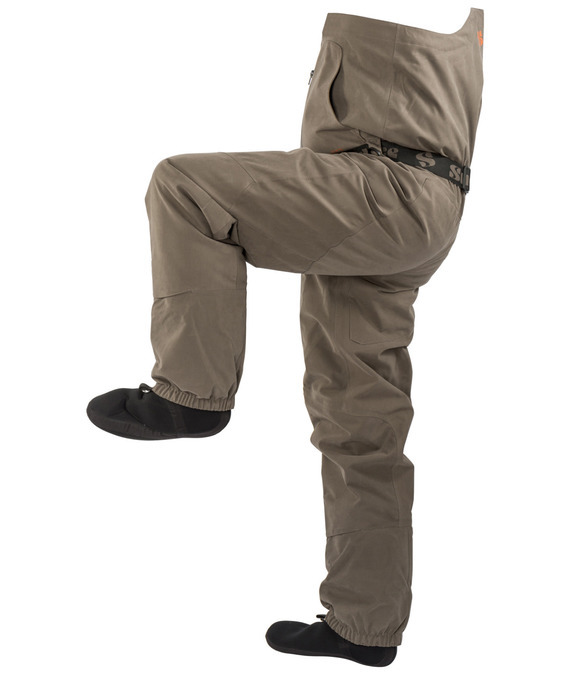 When trying on waders in a tackle shop, try to wear similar clothes to those you wear fishing, in order to get a realistic fit. 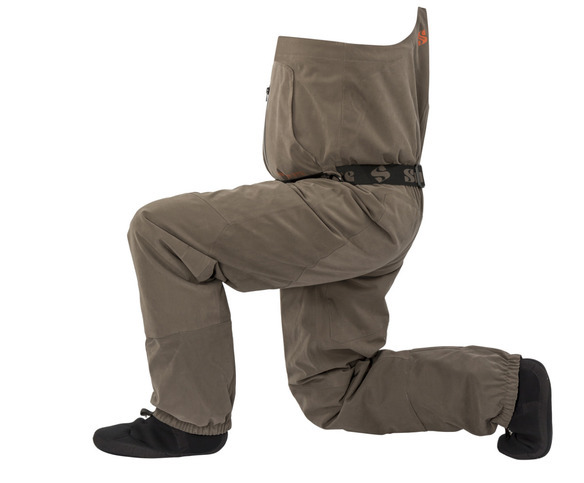 Try the waders in a number of different positions, such as those you would realistically have to get into whilst fishing. Kneel down in them as if unhooking a fish (3). Sit down in them, like you will in the hut or on the back of the car whilst pulling on your boots. Make sure you can get your foot up onto a chair (2), like stepping out of the river and onto the bank. Then finally kneel down on the floor, sit on your heelsand lean your body forward, as this represents the ‘longest’ position your waders will ever be in.If doing any of these manoeuvres you feel the waders pull tight at the knees, thighs, or around your backside, then the waders do not f t you properly and you need a larger size. This photo shows a correctly sized pair of waders. There is room in the body and the legs are long enough, so they do not pull tight, when crouching, kneeling or sitting. Put one foot up on a chair, to replicate the action of stepping up, onto the bank. You should be able to do this without any ‘tightspots’. If not – you need a bigger size. Try kneeling, as if you were un-hooking a fish. If the body or crotch seam feel ‘tight’, you need a bigger body size. If the legs pull tight at the front or back of the ankle seam, you need a longer leg size. down and pull each sock off in turn, gripping the waders at the back of the ankle and pulling the sock off. If you do puncture your waders on barbed wire, gorse or with a fly, get it repaired quickly, as dampness inside can lead to mould, which can cause further damage to the breathable membrane making matters worse! 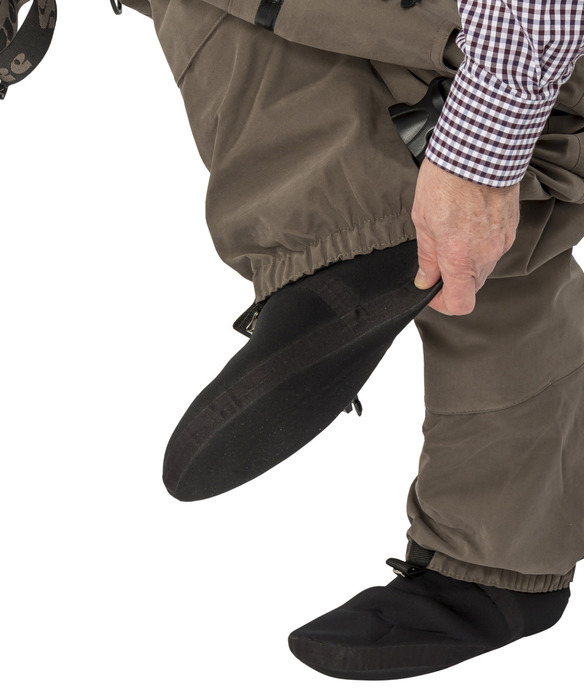 DO NOT pull your wader socks off by standing on one toe, with the other foot and pulling. This will overstress the ankle seam and likely lead to the stitching tearing, resulting in a leak! This is the CORRECT way to remove wader socks. Sit down, or lean against the car or a tree, grip the sock at the BACK of the ankle and pull each sock off in turn. Following these instructions should prolong the life of your waders, and will explain why some anglers get years out of their waders and some get a lot less. Creasing does not adversely affect the performance of waders, but does look unsightly, so the best way of avoiding this is to hang the waders upside-down in a Snowbee Wader Rack. 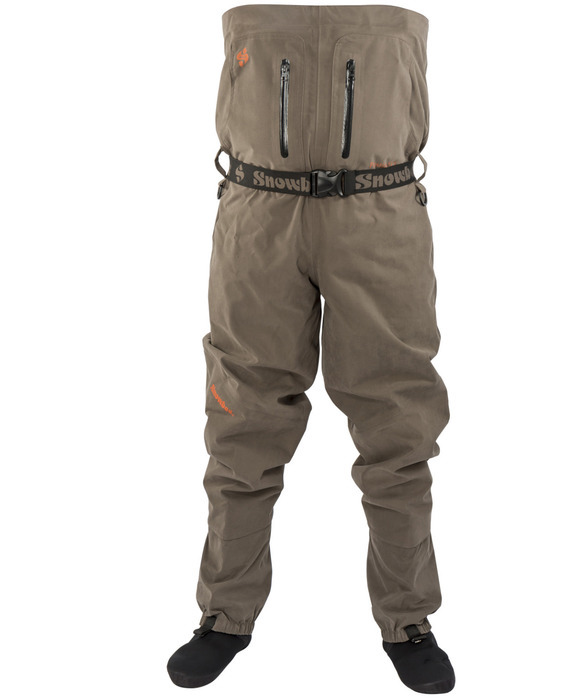 After use in saltwater, or brackish water, the waders and felt soles should always be hosed down with fresh water. It is important to dry your waders thoroughly, inside as well as out. If not, mould can develop which can cause damage to the breathable membrane resulting eventually in a leak.